Have you recovered from your food coma yet? Did you have a wonderful Thanksgiving with friends and/or family? Pull up a chair and tell me how you spent your holiday (yes, I know I am being very America-centric here, and I do apologize to my dear international readers who have had to suffer months of food media turkey talk for a meal you don’t eat.) We had a lovely, lovely meal in Tel Aviv with fellow expats, hosted by our friend’s kind and generous parents who fed a bunch of homesick twenty-somethings. There was even cranberry sauce. 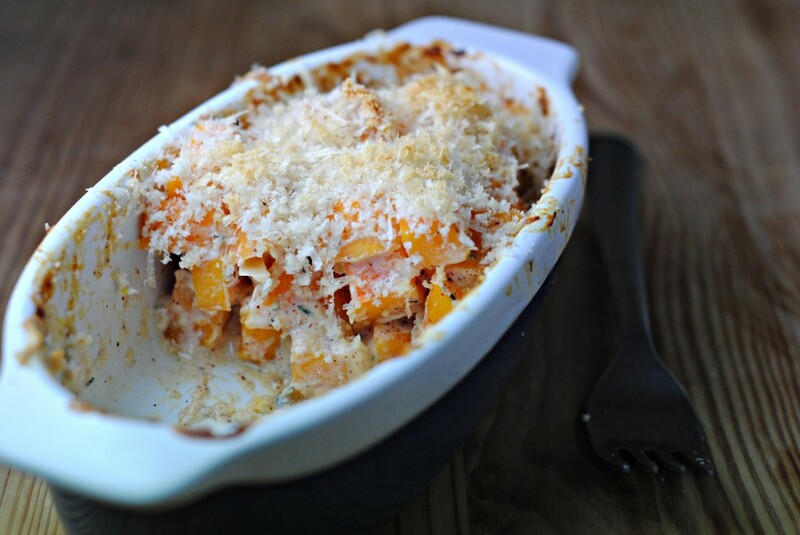 This easy butternut squash gratin is fall comfort in an elegant baking dish. In a large bowl toss together the squash, cream, nutmeg, oregano, garlic, ricotta, chili powder, and ¼ cup of the Parmesan. Transfer to a large baking dish or divide among two smaller gratin pans. Cover loosely with tin foil. Meanwhile, mix together the remaining ¼ cup Parmesan with the bread crumbs. Remove the squash from the oven and discard the foil. Lightly toss the squash. Sprinkle evenly with the Parmesan-bread crumb mixture and return to the oven. Bake for another 10 to 20 minutes, or until the squash is tender and the bread crumbs are lightly browned. Remove from the oven and allow to rest a few minutes before serving. My Thanksgiving was so wonderful … the meal was amazing … I actually did not overeat, so I feel great today … I am visiting my sister, and I am full of happiness … I am very, very close to my siblings and enjoy every single second with my family. I am stopping by my favorite blogs to wish you and yours a great start to the holiday season! Your Thanksgiving gathering sounds wonderful! And your gratin looks amazing! Thank you Liz! It was nice to have such a great Thanksgiving so far from home. I’m so glad you had a wonderful thanksgiving day Katherine! Sigh.. I will have a recipe with butternut squash but it’s for next week! Can I add it in your post then? I know what you mean. But once you start branching out it’s hard to stop! I made butternut squash soup for dinner tonight! And glad to hear you didn’t have a Thanksgiving food hangover 🙂 Come to think of it, I behaved myself pretty well too! Glad you could celebrate the day with others. We were on our own this year so I made…Reservations! We ate a lovely meal at a local restaurant-all the traditional turkey dinner bits and pieces but no washing up. I enjoy these bloghops, Katherine, because I get to meet other interesting bloggers. Thanks! No Thanksgiving for us, but I’m enjoying cooking with all the autumn ingredients! Oh I’m so happy to hear that Sarah! Do you get the usual (from an American perspective) autumn ingredients in Hong Kong? We get the autumn vegetables, like crookneck and butternut squashes, pumpkin, and parsnip. But I have not seen canned pumpkin round my part – I bet they have some in the specialty store, though. I don’t get out there much. Actually, I avoid it because I can go a bit spending crazy in there! So interesting! It’s very similar here. I’ve heard you can find canned pumpkin in Jerusalem but I’ve had a few people bring some cans from the States, and I’ve also taken to making my own. I know what you mean about over-spending in specialty food shops! This looks so good. I am impressed with all the cheese. Just makes me want to spoon right into it. The pics are great. You on a bad day is me on a good day. Lol! Thank you Kim! You are too sweet. That is so not true! Sounds like you had a lovely Thanksgiving! Ours was enjoyable and calm in comparison to most holidays. It was just me and the hubby, but we still did the whole turkey and dressing, cranberries and beans. We love leftovers! 🙂 I haven’t purchased a butternut squash this season yet, but it’s time and this is a great recipe to start with! We’ve been eating lots a soup so a gratin sounds perfect! Oh that sounds so nice! We love leftovers too, they’re the best! Yes, this gratin would go great with a soup. I still have my eyes on your pumpkin and chestnut soup! I made a butternut squash and chestnut soup tonight (again with the butternut squash!) but want to make your recipe exactly. Looks so good! Thank you Jennifer! I couldn’t tire of butternut squash either – just had it again for dinner tonight! Thank you Nandita! Yes, this would be great for Thanksgiving, or any Fall meal! What a yummy looking dish to be served for the season. Simply delish. Hope you’re having a fabulous Thanksgiving with your family. Thank you Kristy!! It’s perfect for Fall. I hope you had a great Thanksgiving as well! Thanks for the blog hop Katherine! I hope your Thanksgiving was great. I am still recovering from food coma but I would eat this entire dish. I adore butternut squash! Me too! In fact, my husband and I each polished off half of this recipe. This looks so delicious. I love butternut squash and will try this before the weekend is up! Looks delicious! I love gratins, and have never had a squash one. Very curious! Glad you had a great Thanksgiving – ours was wonderful (but how could it not be? It’s our favorite holiday). I love gratins and love squash in all its forms, particularly butternut. But like Kiri W., I’ve never had a squash gratin? Why is that? That will have to change. Thanks for a terrific recipe. So glad to hear you had a nice Thanksgiving! I’m with you on it being my favorite. Squash gratin is wonderful, and it sounds like something you will love. I hope you enjoy it – let me know! Oh wow, that sounds marvelous Judee! Sometimes it’s nice to have a break from traditions too. Your dish today look not only served very appealing, but look so tasty too! I love your photos!! Oh my gosh, the gratin looks delicious! Anything with cheese makes me very happy but especially the sweet squash too! It has spurred me to post a drafted butternut squash recipe which I will add to the hop soon! Hi Katherine. My Thanksgiving in California was wonderful. Since it is only me, my husband, and my parents, I cooked a Hainenese Chicken Rice dinner instead of a full blown turkey meal. My mom cooked two other simple but delicious vegetable dish and a wonderful Chinese “slow fire” soup. I don’t think I’ve ever had butternut squash gratin before, but I am glad your recipe uses less cheese and cream. I should give your version a try! Glad to hear that you had a wonderful Thanksgiving overseas too! Sharon your Thanksgiving sounds wonderful! All of that food sounds absolutely delicious!!!! I hope you enjoy this gratin if you do make it 🙂 And thanks for stopping by! I don’t have a butternut squash recipe but I did enjoy checking out some of the entries here. Your gratin is my favorite among all and I’d love to give it a try myself!! Sounds like you had a lovely Thanksgiving celebration! We spent ours in Wash DC with my whole side of the family. Lots of fun and good food! You have a terrific gratin here – I never tire of butternut squash. We did! Sounds like your Thanksgiving was great as well. I never tire of butternut squash either – so good, and so versatile!